Dobby is the devilish house elf in the Harry Potter series. We all know that as soon as Dobby is given his sock, he is freed! Step off into the secret world of sock knitting by trusting this pattern that HAS NO PICTURES! 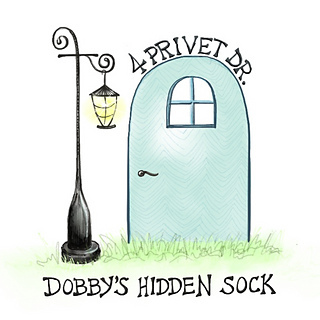 Dobby’s Hidden Sock will no longer be hidden as you knit this sock and the pattern is revealed. This is a knit for someone who understands basic information about top/cuff down sock construction. It is written for using 9 inch circular needles but instructions for magic loop and DPNs are included to get you started. This pattern also uses the Eye of Partridge heel flap and Dutch heel turn, closing the toe using the Kitchener stitch. Go find some gorgeous variegated yarn (and a contrast color of 15 gm if you would like), I am recommending Peggy Jane Fibers, sit back, trust the pattern and see Dobby’s Hidden Sock reveal itself! !